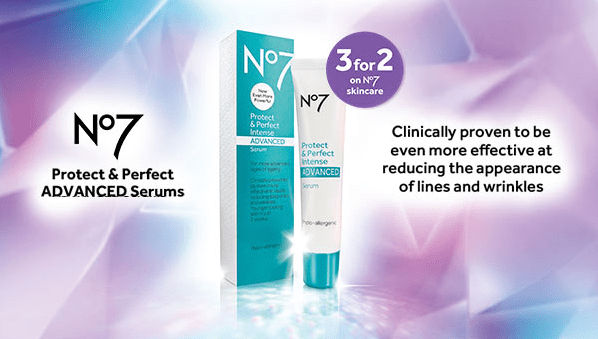 Boots No7 Protect & Perfect Advanced anti-ageing Serum disappeared off the shelves at Boots stores all over the UK following its recent launch. Elixir has one sample of this amazing wrinkle blaster which is suited for those of us aged 35-45 (£24.95 for 30ml) for deep lines and wrinkles and contains hyaluronic acid. The new serums contain advanced peptides which boost the power of the original product. In tests on real woman 80% who already used the original products said they saw an even better result from the new serums. The two new serums contain advanced peptides which boost the power of the original product. In tests on real woman 80% who already used the original products said they saw an even better result from the new serums. The new advanced serums were tested against the previous best-seller, which sold out after scientists proved it was as good as the best professional skincare. So what are the key ingredients in the new products? 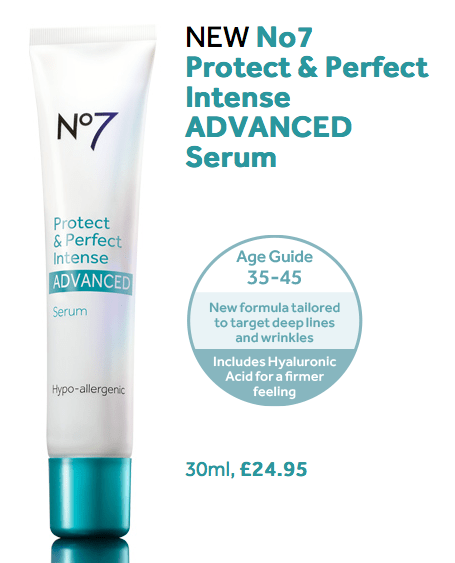 The new No7 Protect & Perfect ADVANCED Serums contain ingredients that build on the existing, clinically-proven formulas of the original No7 Protect & Perfect Serums and improve them in order to achieve the maximum effects in reducing fine lines and wrinkles, with ingredients carefully chosen for their ability to repair, enhance and protect the skin. The new repairing ingredients are specialised peptides. A peptide is a string of amino acids (which are the building blocks of proteins) and in very specific combinations, they have particular functions in the skin. Boots say that new peptides improve the repairing function of the major ingredient in the original formula Matrixyl 3000 which is now present in increased amounts in the new serum. Research carried out with The University of Manchester proved that No7’s blend of peptides drives repair of fibrillin in the skin. The newly added Acetyl di-peptide helps reduce crosslinking in skin, a factor that gives rise to stiffer, less supple skin as it ages. Put together with Matrixyl 3000, it forms a unique peptide blend that stimulates collagen and fibrillin repair in the skin. In total the new combination of Matrixyl 3000 and di-peptide results in more than 30 times the repairing peptide concentration in both of the new No7 Protect & Perfect ADVANCED Serums when compared to the original serums. In the formula for skins aged 25-35 salicylic acid has been added to helps exfoliate the skin by gently dissolving the bonds that hold old dead skin cells in place on the skin’s surface. This helps to keep pores clear, resulting in clearer and blemish free skin, important benefits for the younger consumer just getting into anti-ageing. The new ingredient in the serum for those aged 35-45 is hyaluronic acid, a natural component of the skin, responsible for providing volume or ‘stuffing’ in the skin by helping to bind water into the skin. Once again Boots has tested its new serums on real woman. The tests were carried out on 373 existing No7 users and revealed that 80% of them saw their best anti-ageing results ever. 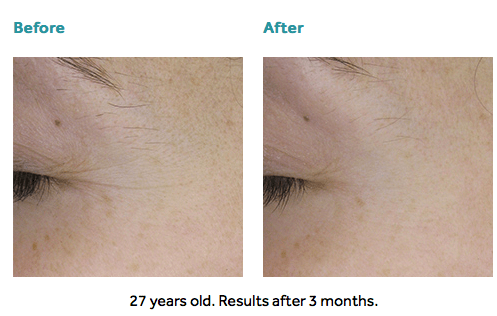 And above is the before and after results of a 27-year-old using the serum for three months. If you would like the chance to win one of these samples please answer the competition question and fill in your name and email address. Goodluck! This entry was posted in Promotions and tagged anti-ageing serum, Boots, No7 Protect & Perfect, serums by admin. Bookmark the permalink.